NDO – The widely known ballet ‘Nutcracker’ will feature at the Hanoi Opera House on December 5 and 6, with modern vibrant remake and new story in order to bring the piece closer to Vietnamese audiences, particularly children. The performance is part of the activities to celebrate Christmas and New Year 2019 hosted by the Vietnam National Opera and Ballet (VNOB), announced the VNOB on November 27. Entitled ‘Nutcracker – Wonder Dream’, the ballet is directed and choreographed by Meritorious Artists Luu Thu Lan and Nguyen Hong Phong. It is staged as a fusion of ballet, Vietnamese folk dances, and other dances of people around the world. Under the baton of conductor Dong Quang Vinh, the ballet tells the story of Quynh Lan, who overslept on Christmas night and wakes up in a wonder land. She joins the Nutcracker Prince on an adventure with lot of surprises. According to VNOB Director, Meritorious Artist Tran Ly Ly, the remake conveys a message that people are all the same, and we dream of nothing but a better life with love and joy. 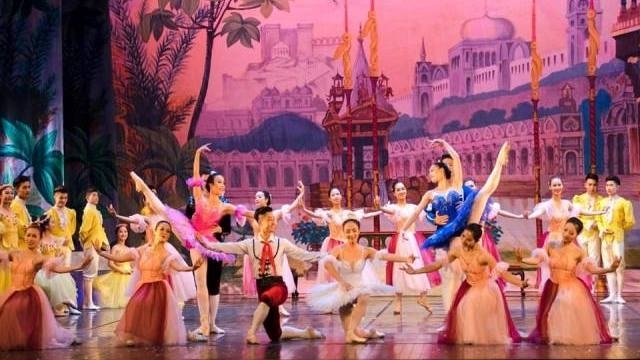 Conductor Dong Quang Vinh said that the remake of the ballet marks a breakthrough for the VNOB, illustrating the VNOB’s willingness to make worthwhile investment in world-famous art works and popularise the genres of opera and ballet to Vietnamese people.